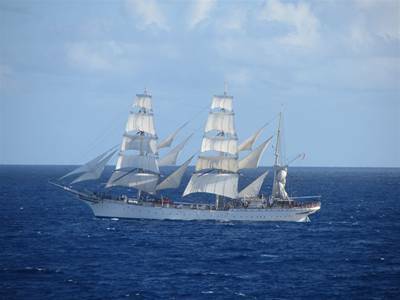 MarineLink is reporting that the Norwegian sail training bark Statsraad Lehmkuhl (which looks a lot like the Eagle) will be equipped with a bank of Batteries for both propulsion and ship’s service power. Electricity, to be stored in the batteries, can come from diesel generators, shore power, or be generated by the action of the ship’s propeller when being dragged through the sea under sail. We have a news release on the electric portion of the Offshore Patrol Cutter’s hybrid propulsion system. There is not a lot of specifics about the system, but it does provide a rationale for installation of this additional system in a ship that above all else is designed to be “affordable.” The news release is quoted in full below. 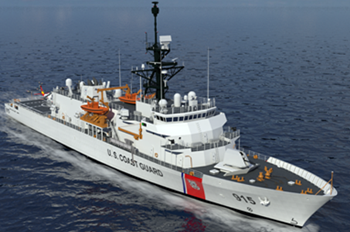 ARLINGTON, VA, April 13, 2017 ̶Leonardo DRS, Inc. announced today that it has been awarded a contract by Eastern Shipbuilding to provide hybrid electric drive systems for the U.S. Coast Guard’s new fleet of Offshore Patrol Cutters. The contract, for the first nine systems, is worth $10.7 million. 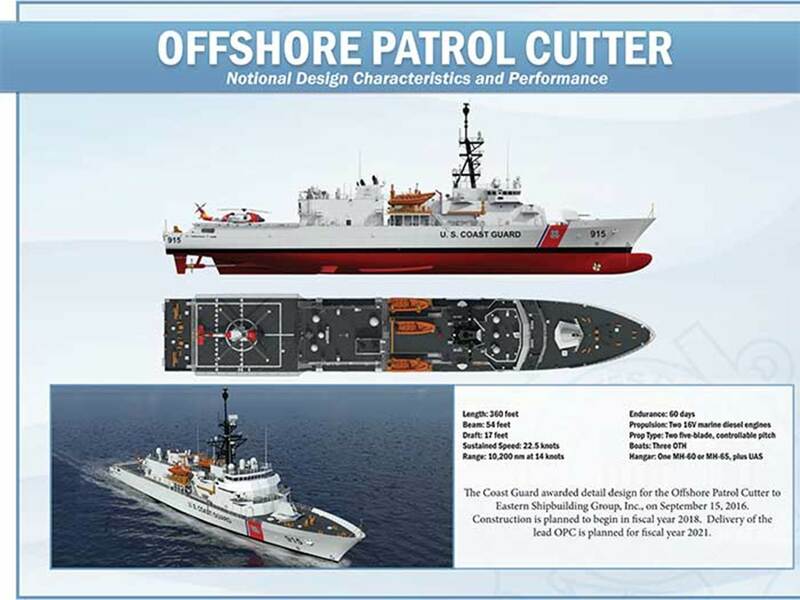 Eastern Shipbuilding is the prime contractor and builder of these nextgeneration Offshore Patrol Cutters. Under the contract, Leonardo DRS will provide its high-performance, permanent magnet motorbased Auxiliary Propulsion System. This integrated hybrid electric drive system provides capability for the ship to operate much more efficiently at slower speeds, increases mission duration capability, reduces emissions and provides emergency take-home capability in the event of a failure of the main propulsion diesel engines. When coupled to the main propulsion gearbox, the system allows the ship to operate quietly and efficiently during loitering operations while providing superior fuel economy for increased on-station operations and capability. We have confirmation that the Offshore Patrol Cutter will have a hybrid propulsion system. This suggests to me that the electric propulsion motors (EPM) will be physically close to the main diesel engines (MDE). Assuming the ship will retain redundant machinery spaces, I will speculate and say, this probably means the ship will have two machinery spaces each with a complete propulsion set (MDE, clutch, gearbox, and EPM) for one shaft, plus one or two generators. Previously I had expected one engine room with both main diesel engines, and a motor room with both electric motors. We don’t have a speed capability for the ship on electric propulsion alone. I had assumed it would provide at least 14 knots to give the long endurance (10,400 n.mi.) claimed for that speed, which might have required only a pair of 1,500 HP motors, but Mr. Wilgress-Pipe’s remarks suggest it might be more. Giving these ships the option of cruising on electric power, provided only by the ship’s service generators, makes these ship potentially more useful as ASW ships. In this mode, they will be quieter and, in noisy littoral environments, more difficult for a submarine to distinguish from other traffic.